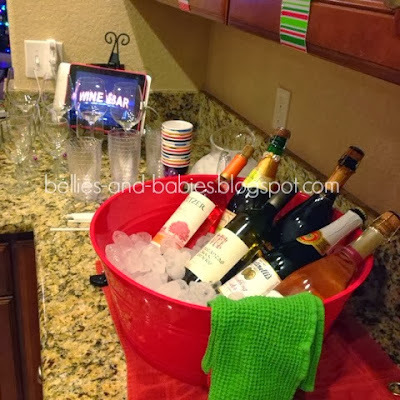 Bellies and Babies: Christmas parties galore! 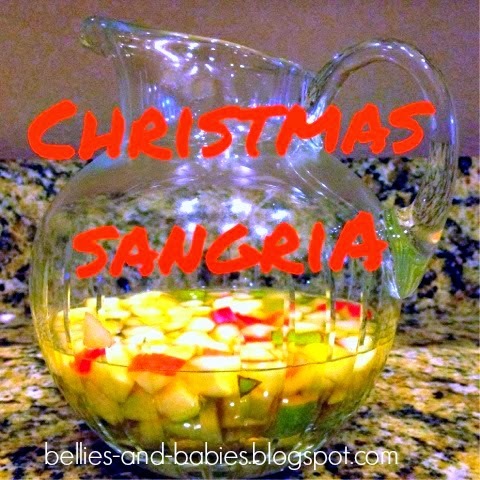 And an AMAZING sangria recipe!!! Christmas parties galore! And an AMAZING sangria recipe!!! We had a very busy weekend! I hosted parties on both Friday and Saturday night. It was exhausting, but SO fun! 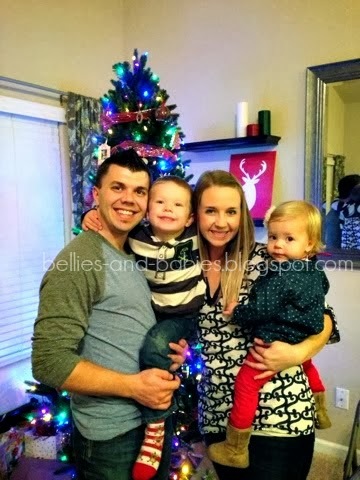 Friday night was a graduation party for my hubby! He completed his Masters of Business Administration degree through University of Phoenix and I couldn't be more proud of him. Or more happy to have him around on nights and weekends again. He's been in school for almost all of our 6 years of marriage. I'm looking forward to being able to plan fun trips and spend time as a family without the ever-present homework lingering over our heads. We had family and close friends over for dinner and drinks. There was no agenda... we just wanted to spend time and celebrate with people we love. We had a wine bar with lots of different types of wine, plus sparkling cider for the kiddos. It was a hit and the perfect addition to our fun night! On Saturday night I threw a Pinterest Party. I had seen the idea online somewhere, but I decided to just do it how it seemed easiest for me. 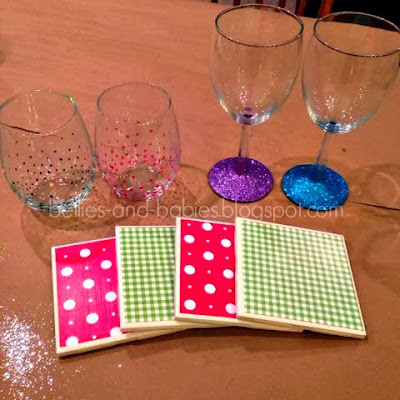 I picked three crafts that I found on Pinterest and pinned them to a board I created for the party. I then allowed other people (aka- the people I invited to the party) to pin to the board. Everyone chose a food they wanted to bring, then pinned it to the board. This allowed us to have a variety of delicious food, and also allowed everyone to get any recipes that wanted for themselves. Everyone chose a craft or two to do from the ones I had posted. I bought supplies and each person chipped in money for each craft they chose. It was a great night of crafting and cocktailing, and we had so much fun! One of the recipes I pinned was for a "Thanksgiving Sangria", but I didn't have all of the ingredients on hand, so I adjusted it for what I had... and you guys, it was SO delish! I will definitely be making it again! Stir everything but the club soda together in a pitcher and let sit for 6-8 hours in the fridge. When ready to serve, remove from fridge and gently stir in club soda. Enjoy! And here's the crafts I made! LOVE! Some people also made these adorable ornament wreaths. I already have one hanging on my front door, so I stuck to the other crafts. We had a lot of fun, but I'm glad the weekend is over. And now the countdown to Christmas is really on.... 8 days!!! I've never heard of a Pinterest party, that sounds like fun! Oh that sangria recipe sounds divine. We do Pinterest parties with my group of friends, too! It's so much fun! The way we do gifts is we each make a gift wrapped like a present and then do a "dirty santa" type exchange where you draw numbers and then have the option to steal or keep your gift. Super fun! I love the idea of a Pinterest party! How fun!